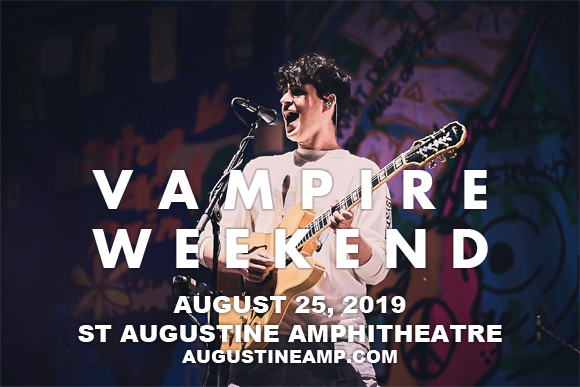 Vampire Weekend comes to St Augustine Amphitheatre on Sunday 25th August 2019! The indie-rock trio's vibrant, world music-influenced grooves have made them a must-see live act, and this tour sees them performing brand new material from them upcoming album Father of the Bride! Expect harmonious, intricate, sunshine-hued tunes from these Grammy Award-winners! Formed by lead vocalist and guitarist Ezra Koenig, multi-instrumentalist Rostam Batmanglij, drummer Chris Tomson, and bassist Chris Baio in 2006, Vampire Weekend is an American rock band from New York City. The group met when they were all studying at Columbia University and they released their self-titled, self-produced debut album in 2008. The album was an instant success, going straight to number 17 on the Billboard 200 and launching four singles: "Mansard Roof", "A-Punk", "Oxford Comma", "Cape Cod Kwassa Kwassa", and "The Kids Don't Stand a Chance". The band enjoyed further success with its follow-up, Contra (2010), which debuted at number-one on the Billboard 200, and Modern Vampires of the City (2013), which won the group a Grammy Award for Best Alternative Music Album in 2014. Father of the Bride, their fourth studio album, will be released in 2019.